Searching for a job will be the second most difficult thing we deal with second only to studying and passing our medical boards. One of the reasons has to do with the antiquated system that requires 3rd parties and massive redundant paperwork for credentialing, onboarding and verifying. This is busy work and having spent nearly a decade in medical school and residency the last thing we need is more busy work. Nomad health is trying to change and disrupt the system by streamlining this process with the use of cleaver yet simple technology. To Err is human and we are no exception. Dr. Nazem and I discuss the top mistakes physicians make when searching for a job from an industry insider. You don’t need to have an MBA but taking the time to gain business acumen will pay off in dividends in not only in your career but in your entire life. Docofalltradez: Welcome to the physician negotiator podcast where no decision is left to chance with your host Doc of all trades. Docofalltradez: Today I would like to introduce Dr. Alexi Nassim. He is the co-founder and CEO of nomad health. Well many health care startups have non-clinical founders Dr. nauseum continues to practice internal medicine at Will Cornell Medical College while building his business. He graduated from Yale Medical School and carries an MBA from Harvard. He feels passionate about fixing the broken health care system and solving the upcoming physician shortage by directly connecting major stakeholders in the delivery of health care namely the employers and medical professionals. His company nomad health accomplishes this by creating an online marketplace for physicians and nurses and skipping the middleman Alexi welcome to the show. Alexi: Thank you so much it's great to be on. Docofalltradez: Excellent. Hey you know Alexi you have an amazing background. I did a little bit of stalking on you. Hope you don't mind. No. I read an article you had written on Kevin M.D. about immigrants making America great. Yeah. And you have quite a legacy in your background your granddad was an anesthesiologist and your dad was a Buckeye graduated from Ohio State which practically makes us related since I'm a Buckeye Anesthesiologist. Alexi: Oh wow okay. Well nice to meet you brother. Docofalltradez: Yeah likewise. And your entire family is filled with medical physicians and pioneers. It's incredible. Alexi: Yes and I'm very lucky to have grown up in that environment. Docofalltradez: And do you feel like that is kind of played a role in your entrepreneurial spirit. Alexi: Oh most absolutely. I had actually interestingly both entrepreneurs in my family and physicians so I guess one could say that I was predestined to go down the path that I'm going down. I grew up in a household where most of my extended family were in some way shape or form involved in the medical profession. And so that originally served as an inspiration for me and as I have actually entered and practiced in the profession. Having all of those family members who are actually colleagues is now served as a support and a push and really sort of like a great set of consultants for me. And then on the entrepreneurial side especially through my dad I was exposed at a very young age to the concept of creating something from nothing making companies that use technology to solve real world problems. And so that brew at home really set me as I said on this pathway and so for sure I'm indebted to my family for what I'm doing today. Docofalltradez: So lucky and you know couldn't come at a better time. Medicine right now is just struggling. I just read an article yesterday on The Wall Street Journal about how health care in general is not now the number one employer of all people living in the United States. And to say that it's not in the best shape is an understatement. And I'd like what you're really doing a nomad health in and trying to help solve those problems. So if you wouldn't mind can you share a little bit of a little bit with us about how nomad health works. Alexi: Sure. So Nomad the problem that we are confronting head on is the challenge with providing enough staff clinical staff to patients in American hospitals clinics and other venues of care. I'm sure you've heard that there are huge shortages of doctors nurses advanced practice providers and many others. And solving that problem is going to be critical to the future functioning of the health care system. And so what Nomad is trying to do is to introduce technology solutions to provide more efficient more effective health care staffing myself as a doctor and some of my co-founders also doctors really felt the pain of this problem trying to get recruited into a job or or even just looking for a job yourself is a very inefficient very frustrating process that involves third parties that involves lots of paper and fax machines and phone calls and it's just not a very modern process and in a world where we really need to have the best clinicians at the bedside it's crazy that we're spending so much time energy and money on getting patients the doctors and nurses to the bedside. Alexi: And so the problem that we're trying to solve is actually sort of shortening the distance and the time between the clinician and the bedside and that's what we do know that. Docofalltradez: And so with so how is it different from a traditional recruitment company then yeah. Alexi: So a traditional recruiter is a third party. So there is let's say a hospital and a doctor that want to work with each other well traditionally haven't you. In order for them to find each other and connect they've got to go through a staffing recruiter what Nomad does is eliminate those staffing recruiters and using technology replaces all the functions that those recruiters provide and allows the doctor in the hospital to connect directly and consummate that relationship directly using technology. So instead of having to interview on the phone with a broker and then with a friend with the hospital and the medical director and all that kind of stuff instead of having to mail in paper forms instead of having to sort of look for credentials all over the place we've centralized all of those processes online in a very easy to use technology based platform. So it had that same ease of use to something like air PNB or kayak where you do very high cost complex transactions very easily very quickly online without the intervention of a third party. We're trying to bring that same level of convenience to staffing. And so basically we're cutting out the middleman and allowing the two parties that are interested in working with each other to do that without any outside assistance. Docofalltradez: And that is a fascinating concept because if if you know the modern physician orders looking for a job today and if they have multiple recruiters they may have to go through multiple processes multiple credentialing especially if you're a traveling provider. And so each time you go through the process you have to replicate that paperwork over and over and over again. So is no nomad then creating a database where you would just have to submit it once. Alexi: Exactly. That this company was born out of that very frustration. I I tried to do a locum tenant's job which is that kind of traveling Doctor job that you talked about. And it took me 10 months to organize just three days worth of work and it's because I had to talk to and submit. So I talked to so many brokers and met so many different applications and that just takes a lot of time. Alexi: And so what Nomad does is we essentially have a common app you apply one time to our platform you upload your information and your preferences etc. and then all you need to do is to just point out the job that you like and you don't have to re upload your ACL as current anymore or tell us again about where you went to med school. Alexi: And so that substantially cuts out the sort of hassle of working working with multiple of multiple places. And so ultimately what we want to be is the one stop shop for a doctor the one stop shop for a nurse trying to find a job or leverage the clinical skill set that they have. Docofalltradez: So there are traditional credentialing companies that you can upload all this information to as well with wood would then if you were to get hired through nomad would you be able to then use the information that you submitted to nomad to get your credentialing at a particular institution. Alexi: Yes I mean it varies a little bit based on institution and we try to automate as much in the process as possible but of course there are local rules and regs for every institution and so sometimes they require you know their own their own additional credentialing and that's unfortunate something that we can't control. But we hope that over time nomads quality become so well trusted by health care institutions that when nomad credential somebody that say so is enough and wouldn't require any additional we're not there yet but I hope and expect that we'll get there eventually well and that seems to be the problem you have all these different institutions and different state medical boards and who all have their own systems that have never once really taken the time to talk to each other for the most part and would like to win them. Yeah I mean I think that as much as possible we're trying to integrate with existing systems so that we're not asking people to duplicate efforts that they've already made. And then you know as you said make them talk to each other biotechnology and that hopefully will move the needle and really get us back to the things that actually matter taking care of patients and stop doing things that don't matter like filling out paperwork. Docofalltradez: So the original concept was for temporary employment. Was it always your intention to do this for permanent work. Alexi: Yes it always has been our goal at Nomad is to become the jobs marketplace for health care. So any kind of job for any kind of clinician should be something that you can find and do on Nomad. So if you're a doctor we want you to be able to find locums in plain then full time employment in telemedicine employment and many other kinds of jobs that would take advantage of the clinical skills that you have. And then we also want to offer that same that same upper set of opportunities to nurses in peace space and in the future other types of clinical providers. So all along it's been our goal to provide a one stop shop as I said before. And just takes time to grow a company like that. Docofalltradez: Now you've been growing for about three years and you you covered 30 states with the expectation of covering all of them. Is that correct. Docofalltradez: So what percentage of jobs do you expect your system to have in the database. Alexi: Well so ultimately the goal is that every job that's available in the world of medicine is going to be on Nomad. We're obviously not there yet today but there are literally thousands of jobs on the nomad platform today. We're in as you said about 30 states mostly the east coast the west coast and the upper Midwest. And obviously trying to get to to all 50 in short order but you know thousands of jobs are up there. So it's it's a pretty good sample of what's out there but of course not every single job in American hospitals and clinics. But we're working our way towards that. Docofalltradez: Now you mentioned that this is a billion dollar industry which really surprised me. I was listening to one of your speakers talks and that's a lot of money. And that tells me that this industry is pretty dug in. So how is no no no man is going to be able to compete with such a large industry and scale. Alexi: Yeah well so first of all it's a 20 billion dollar industry. So it's a very huge market and it's growing rapidly because of that growing shortage of clinicians how Nomad is going to win in the spaces that we provide better service at a lower price. And this is a classic disruption story. We are using technology to as I said offer better service at a lower price. And that's kind of unbeatable. Really what we need to do is just continue offering a high quality experience that serves the real needs of our of our users doctors nurses clinicians. Alexi: And on one side and employers on the other I have no doubt that what we're offering is head and shoulders better than anything that a traditional company can offer. And so I think it's really a question of if but when we will. Docofalltradez: I was really surprised how how much of a commission these companies get when recruiting a physician now. I think you mentioned at some point like ten thousand dollars or upwards of 40 percent of the transaction. Alexi: Yeah. So it is an extraordinarily expensive industry today. So a traditional staffing agency for temp work. So in other words locums for doctors or travel in nursing for nurses they're charging 40 50 60 sometimes 70 percent commission which is unbelievably high. We're able to do it for a fraction of that cost you know 20 percent of that cost are 15 percent of that cost. So is it because we don't have the legions of of manual laborers on call centers and filling out paper forms and stuff. We're using technology so we're able to cut a lot of costs out of the system. So you know in our marketplace we're not only as I said offering a better service but we're able to do it at a much lower price for the clinic for the employers and then the clinicians end up getting paid a little bit more as well. So it's a win win win. Docofalltradez: How is the disclosure process or how's the discovery process of reimbursement for a clinician take place on Nomad. You mean reimbursement for clinical services matters. Weather and I'm thinking mostly like locums because typically they charge by the hour or by the day. Alexi: Oh yeah. So the way it works is that we don't actually at Noma get involved in clinical reimbursement. So what ends up happening a typical locum for example will in their contract with the facility which is signed through Nomad is saying look I'm going to sign over my billings to to the employers or the hospital for example. And in exchange I'm going to be paid an hourly or shift based wage. Alexi: And so that's that's sort of that's sort of what the mechanic. Docofalltradez: So in terms of the actual amount and would that transaction or negotiation take place between the two parties between the doctor and the employer the nurse and the employer and that happens directly on the nomad platform. Alexi: So a hospital might pose a locums job and say hey we're looking for an emergency department physician and we want to pay them you know one hundred eighty five dollars an hour. That'll be up on the job plus very transparently unlike in any other traditional agency. And then the doctor can say Yeah I'm interested in that job but could you possibly do two hundred and then the hospital might come back and say oh well let's do it for one ninety and then they sign a deal through through the nose that's like that. All that negotiation happens right on the pile. Docofalltradez: It's amazing. So then you could probably can you negotiate other things like transportation housing and that sort of thing. Alexi: Exactly. Yeah. So all of that stuff you can negotiate right on no matter whether it's expense reimbursement travel or reimbursement housing you name it really anything can be can be negotiated. Docofalltradez: And the interesting thing about that is it gives the hospital more leverage because they get to get a a better clinician for a cheaper price because they're not paying for the commission. And then it sounds like the physician and the nurse will win because then they could ask for more and the hospital would be more willing to give it. So that makes sense right. Alexi: That's exactly right. So because the clinician is getting paid more you might actually get better people more quickly and because the hospital is paying less they can hire more people more quickly. So it's ultimately serving that core problem which is the shortage. So I think one of the things that we're very excited about it Nomad is the ability not only to improve the efficiency of the existing staffing market but also to draw more people into the contingent gig part of it. So get more people to do locums get more people to do travel nursing. I think there are substantial and substantial numbers of doctors and nurses who want to do this work but have shied away from it traditionally because it is so frustrating and difficult to engage in that market. And so by creating an easier system where you can possibly get paid more you know we can possibly increase the supply side of the equation and address at least a portion of the shortage problem. Docofalltradez: And you know I set up my own account and it was free and it was actually pretty pretty easy. I was really impressed by how the interface was fairly simple so for the it doesn't take a technocrat in order to figure out how to navigate it Yeah absolutely. Alexi: I mean that's our that is our whole goal is to make this so easy to use that you want to the the the sort of bar that we're trying to cross. Sort of the bar that is set by the traditional agencies is so low that it's very easy to clear it but we don't want to just step over it. We want to leave home. We want to make it incredibly easy to use nomad so that you know it reduces the friction to getting into this market. Docofalltradez: It's a relief. Interacting with the computer that's not easy. JHA you know because right now I think on the my average patient that I see I'm probably doing 100 clicks and I know many of my peers feel the exact same way. So it's refreshing to see something that actually is pretty simple and it works the way it's supposed to. Alexi: Oh yeah totally. I mean technology typically in healthcare has been so disappointing and we want to reverse that trend and just offer something that is consumer great. Alexi: You know that has the same ease of use as the things I mentioned before like Air B and B we don't want to our competitive set in terms of technology ease of use is not an EMR but rather you know the app that you use on your phone every day nice. Docofalltradez: Well let's switch gears a little bit I'd like to start talking a little bit about how we can help graduating residents and you know it is job season right now. You know physicians are looking for their jobs and it seems to me they're securing employment earlier and earlier. I have numerous peers and mentees who've already secured jobs for July which is just incredible. And that seems to be the norm. I also work at a place where we have a a school. Same thing. We're currently interviewing for four jobs for next year. And despite that we're still struggling to get get employees. Docofalltradez: It's incredible. But I think there's a lot of stress involved with trying to secure a job when you're a resident. And I think that if you're spending most of your time focusing on studying for your boards finishing your clinical is I think the last thing that you want to do is really spend that much time and effort looking for job. But it's also the most important thing. Docofalltradez: How will see me make sure I phrase this right. A lot of physicians when they first graduate whether in this process of looking for a job don't even understand how they begin looking for a job. It's a good fit for them. Does does nomad have tools in it. That kind of help them understand what's going to be the best fit for them in terms of location lifestyle etc. Alexi: Yeah I mean this is a very challenging thing figuring out what your first job post residency should be in fact you know during residency you're hardly given any exposure to the variety of opportunities that might be out there and certainly not equipped with the tools to help you make decisions about what the right and what the right job is for you and you don't even think about things that you're gonna end up having to negotiate. Well tell me about the malpractice insurance that you're going to give me. Tell me about what an RV you is. Tell me about scheduling and call and things that you don't typically think about when you're a trainee and certainly aren't given any real training on and so there's a couple of things I think that nomad does to help with the with the first time first time job seeker. First and foremost we try to give as much information as possible upfront about the various job opportunities that you can have it. So we're not trying to hide any information we're trying to take everything you could possibly want to a need to know in order to select a job. So try to tell you about the facility that you might work in and tell you about the nature of the work the kinds of patients that you have all that kind of stuff. So that's one thing. Just having more information is super helpful. Additionally we have a bunch of resources on our site to help you learn about what you're supposed to do to effectively take a job or decide between job opportunities. Alexi: So for example I mentioned that practicing come on our resource center and our blog. And you can see some guidance about how to how to approach that question. And then at the very end of it also there is no substitute sometimes for talking to someone who is an expert in the field and so at any moment despite the fact that we're a technology company in China replace as many steps as possible with tech. We have great people here. We have what are called nomad navigators and they help you navigate your job search. And so if you'd like we can reach out to us directly and and ask those kinds of questions and say hey you know what should I be looking for. How should I even prepare my resonate and put my best foot forward kinds of things that you wouldn't necessarily think about in your training but are certainly very important to when you are actually seeking a job. So we try our best to be your your supporter and your advocate and try to give you resources from start to finish. Docofalltradez: What a fascinating prospect. So you just this nomad Navigator is a person that you can contact very early on is it is it can still considered free of charge until you get the job. Alexi: Well absolutely yeah. So the moment you sign up for a nomad you can schedule time to speak with a nomad navigator and they can help you in any way that you see fit. We want to enable you to do everything and as much as you want self-service but when you feel like you need a little bit of guidance there's always a an expert a person that is available to talk to you. Docofalltradez: That's amazing. In terms of the contractual sale. So we've talked about the salary negotiation process in terms of the contract. Once the contract or there's a letter of intent that's been signed nomad no longer is involved in the process beyond that. Correct. Alexi: That's correct. Yes. So for for these full time jobs permanent jobs. Yeah. We primarily serve that the purpose of connecting the two helping you sort of get the relationship off the ground but then when it gets to you know actually doing the formal employment that becomes a transaction between the doctor the nurse and the in the facility. Docofalltradez: Ok. Now there are various practice type models in the industry today. So we there's still you know a couple of people to do solo practice. We have a group practice. We have hospital employees and then we have academic does nomad really focus on any one particular area or is the goal to have all those modalities represented all the different job types. Alexi: Yeah we're trying to have all those different job types available on Nomad. So are job opportunities are pretty reflective of the opportunities that are in the market at large. Docofalltradez: So you wrote an article. Well I actually didn't write somebody on your Web site wrote an article called The Five mistakes doctors make when looking for a job. And I see these mistakes all the time and I'd like to go through them because I think they're really important. And the first thing that you say is mistake number one is keeping your job search narrow. Alexi: I think I think that is a very common problem. It's very easy especially for a first time job seeker to really only default to the things that they know. So the location that they're comfortable with the practice setting that they're comfortable with and that can you know that can be great. I mean if you love practicing in an urban academic environment just like the place you train fantastic but you may also like other you may also like other types of opportunities. A suburban or rural location a non teaching facility private practice. So there are so many different kinds of things that you can do and a lot of them you don't get exposure to while you're training. So keeping the search narrows is not serving you're not serving you. As well as it could mean eventually you have to narrow your search but start start broader. Docofalltradez: You know it's interesting you said that you have a very narrow exposure and I've read a couple of articles where some people have actually advocated doing locums for a period of time in order to get that exposure. Where do you stand on that. Alexi: Yeah actually that's a great idea. It's kind of like a tribe before you buy approach. You know when you work as a locum you can work for months at a time in a facility really get to know the facility the patient population the geography etc. and kind of figure out hey is this for me or not. Is this style of practice for me or not. Is location for me or not. And so I am totally supportive of this concept and I think actually more and more people are starting to approach their first jobs this way whereas traditionally attendings at least my attendings would would encourage me not to do that. Docofalltradez: So it's such that you can build relationships but I think that the trend is changing. I think you know if you can find a location based upon like for example the way nomad illustrates what each job entails you can feel more comfortable going into a situation and feel like you're being supported as opposed to traditional you go into a locums you may feel like you might be the odd man out. Alexi: So yeah no that's absolutely right. The I think there is a changing attitude amongst the millennial generation that would like this kind of gig work. And then additionally I think there's a changing attitude towards locums. I think that there you know some of the unfortunate stigma that may have been associated with that type of work in those type of clinicians is fading away as more and more people start to do it. So I think it's a I think it's a reasonable and in fact a very good thing to start doing. Docofalltradez: So I go jumping in a mistake number two jumping at the first opportunity which I think is basically we've kind of illustrated with mistake number one. If you jump at the first opportunity you may not necessarily find the right fit right off the bat that's exactly right yeah. Alexi: So just keep looking and you'll remember always that as a doctor you're the scarce resource. And so you are highly desired and so you should find you should feel the right to be selective. And so don't jump at that first opportunity you know on and on. Docofalltradez: The other interesting thing about that is I think recruiting companies in general are upping their strategies to try to get these doctors earlier on. I went to a dinner two weeks ago a recruitment dinner where they were inviting interns. I've never seen that before. And the topic was to be tried to keep it as light as possible and try to be unbiased as possible but at the end of the day what they really wanted to do was put their name in front of that physician. And this particular health care system was offering residents a stipend that they could sign up immediately so they could they can get them onto their system. So I think you have to be really careful with something like that because you're going to commit as an intern might be a little bit too early in the game in my opinion. Alexi: Yeah absolutely. I mean look I don't think that any of these systems are approaching things with any nefarious intention. I mean that could be the right job for you and so think about it. You know consider it. Alexi: And you know it may not be the wrong thing to do but at the same time remember that you do have lots of options and you should feel as I said the right to be selective. Docofalltradez: I agree. So Mistake number three is only considering large cities or facilities. Alexi: Yeah. And so that gets back to the thing that I was saying before which is that you know most of us end up training in large facilities and usually in cities. And so we only have less and less exposure to environments that are not like that. And so it's a very easy thing to default to to say hey I'm used to practicing in a 500 bed academic facility in a city with a million plus people. And it's the only place I could ever feel comfortable. But you know that's not necessarily true. So you think about different types of locations and and facilities. Docofalltradez: Where do you think there's greater demand right now with respect to city size or population size. Alexi: Well I mean nationally there is greater demand. Patient demand in places that our population centers. But there's a relative oversupply of clinicians in those places when compared to lesser populated area. So what we see is is that some of the greatest demand for clinicians is coming in suburban and rural locations and less so in in urban locations. But across the board there's a physician shortage. So again you know the doctor and the nurses that is the scarce resource. Docofalltradez: Right. And just take them before negotiating contracts poorly. Now that's kind of the basis of my podcast. The physician negotiator because I've seen it time and time again and I think the biggest thing physicians fail to realize is when they're actually in a negotiation perfect example this morning I was at a meeting with my hospital and we're about to go down a person. And so the hospital was trying to tell us how we're going to take extra call and and all of a sudden I realize I'm in a negotiation and I'm just at a meeting. So it was pretty funny. Alexi: Yeah I mean at the end of the day I mean medicine is a business and that's not something that any of us are really confronted with as medical students or trainees. And so getting smart on what matters economically is really important because then you know what to negotiate on. So do things like look at the at the data about the specialty and the location that you're in to see Hey what should I be getting paid. And then also learn about other finer points I mentioned briefly before about malpractice and our views and other things like that. So just talk to your colleagues. There's lots of great resources online also I nomad to learn about the various things that you can negotiate. Knowledge is power. If you don't know about these things you're definitely not going to negotiate well if even just know that you should negotiate about them your 10 steps ahead of the game. So I'd say you know learn about those things and and bring them up. Alexi: And you'd mentioned on a prior podcast that the physicians really struggle with understanding the business of medicine and you have great business acumen and successfully negotiated this thriving startup. But you also got an MBA. What would you recommend physicians do to educate themselves. Short of short of getting an MBA or you do you recommend they get an MBA. Alexi: Well I mean of course I endorse the idea of an MBA. It's been great for me but I don't think that it's necessary to get an MBA to be an effective doctor. But there are a lot of things that you learn in that education that would be valuable. You don't need to go to school for like there's lots of great resources online to help you sort of have a little bit better business acumen when it comes to the business of your profession as a physician. Tons of great Web sites out there to get smart. I'd also think about you know start start planning. I'm not a financial advisor or anything so please take everything I say with a grain of salt. But you know it's not too early when you're a resident to start thinking about your financial future and you know how to to save and invest for the long term. And so beyond things that are dedicated specifically to clinicians there's a ton of really just financial smarts education that you can that you can engage in early on. And so I would I would encourage you to sort of continue to be a student just a different topic. I think sort of separately. I personally advocate for and have done some of this advocacy formally to get more of this kind of education into a traditional medical school curriculum nursing school curriculum and later in postgraduate training curricula. It is so important at the end of the day as I said Medicine is a business and you will be a better clinician if you recognize that and have some of the tools we should do everything we possibly can to get more of that on more of those topics under the curricula but short of that all of us should recognize that it's an important topic and get smart on it on our own. Docofalltradez: Have you met any resistance from these centers who from from whom you advocate. Alexi: Not not in recent times. Early on in my career when I was you know when I was applying for medical school I knew that I wanted to also go down this business pathway and I had to be very secretive about it because most I didn't really find a lot of receptive ears to that type of approach. Alexi: But in the last 15 years there's been a huge sea change in the medical profession and people really recognize exactly what I said. The medicine is a business and equipping doctors and nurses and other clinicians around the frontline is a smart thing to do because then they can actually lead lead to changes that need to be made instead of people who are non-clinical and don't really understand the nuances of medicine to suggest and make a change in the system without clinical influence so that's a long answer to your question. The short answer is there's not much less resistance than they once used to be. Alexi: I think you're doing a great service here too my trying to raise awareness and to educate. Docofalltradez: I'm trying I'm trying. Last question is mistake number five I don't want to over. We kind of went on a little bit of a tangent but not looking at the big picture is a mistake number five and this is this is for me I think a big one. Alexi: Yeah I mean I think that one of the topics that we hear a lot about in medicine these days is burnout and I think that's because you know people aren't considering the big picture what does it mean to sustain a life a life and a lifestyle. Alexi: And so thinking about what matters to you and what's going to nurture you and your ability to keep doing great work is really important when taking a job you don't want to sort of keep that same pace that you had in your residency. Alexi: This is probably not sustainable. And so you think about things like All right well where and where do I want to be physically I mean do I want to be close to family friends I love you know am I an outdoorsman and do I need that. Do I need lots of culture and you know sort of like access to theaters and museums and things like that. So just consider some of those non-clinical non-professional things and think about how much you want to work think about with whom you want to work. Think about you know the social circles that you want to maintain. There are so many considerations beyond sort of peculiarities of your job you know how many hours how many calls how many whatever that will matter to your ability to do your job. Alexi: And so we we strongly advocate here to take a holistic look at at job opportunities before taking the plunge. Docofalltradez: Well you know on that note the most recent Physician Survey talking about new grads that the survey suggested that positions after two years changed jobs such like more than 50 percent. And I think a lot of it has to do with them not looking at the big picture you know what's a what's a nuisance to you. Day one may you know may be an irritant and by year or two. So I think the big picture is key is finding figuring out what you like and what you what's important to you is the challenge. And so I think that's why when we look back and we're saying you know you got to keep your job search wide. I think that's one way one way you can do that. Docofalltradez: That's right. And also the flip side is I wouldn't say it's a failure if you take a job and end up needing to switch after two years you know you don't want to put so much pressure on that first choice. You know it's okay to adjust and adapt over time but at the same time very important to take as I said a holistic view so that you make as good a decision as possible. Docofalltradez: And that's a fair statement which is why you know you can make an argument that doing locums work at first might be a good idea it might be a good strategy for you. Alexi: Well I couldn't agree more and then I hope that all of your listeners will give it a shot by coming on over to. Docofalltradez: No. Exactly. All right Lexie Well hey how how can we learn more about Nomad and how do we sign up. Well it's super easy. Alexi: Just go to w w w dot nomad health dot com and everything else should be pretty self-explanatory. We worked very hard to make it easy but it doesn't need any extra explanation. So help me come on over and we look forward to working with all of you. Docofalltradez: Well Alexi Hey thank you for joining us. You know I think it's really important that we disrupt all the different medical norms that we have right now. There's so much room for improvement so I applaud you and your and all your peers for trying to make a dent in this and this problem. Alexi: Thank you very much and thank you for what you're doing too. I think it's so important. Once again I'd like to think Dr. Nazem for being on the show. 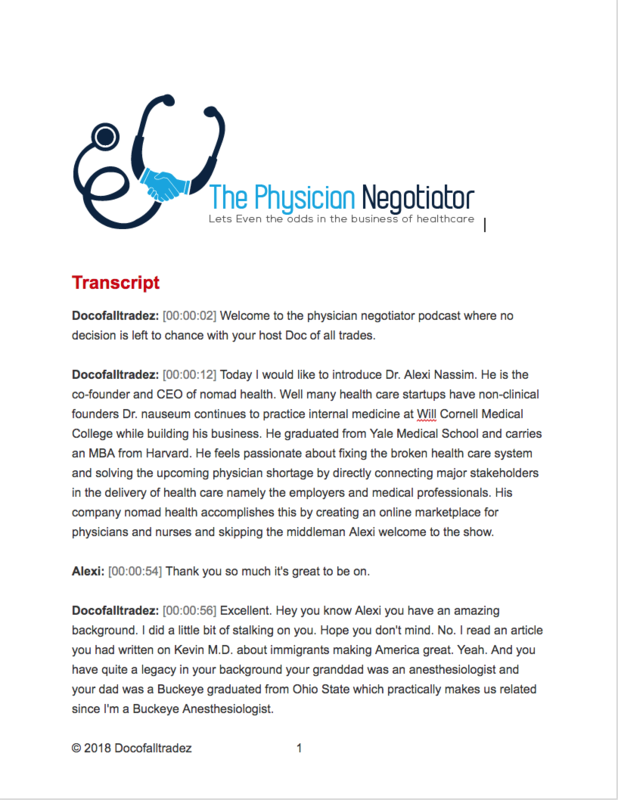 If you'd like to learn more about Dr. Nazem or Nomad Health over to the physician negotiator dot.com forward slash E.P. dash 0 5 that's episode 5 as I'm growing the show I would really appreciate some comments either on the Web site or on I Tunes head over to my Web site. The physician negotiator dot com and there you'll find a button for leaving us some feedback or if you'd like to make the show better. Click on the button that says get answers. Once again thanks for listening. Thank you for listening. We hope you enjoyed the position negotiate a podcast show notes and other resources. Please visit the physician negotiator dot com. I love using Sonix to transcribe my audio file: EP05_Alexi_Nazem.mp3! Use Sonix to automatically transcribe your audio files; Sonix is the best way to convert audio to text online. 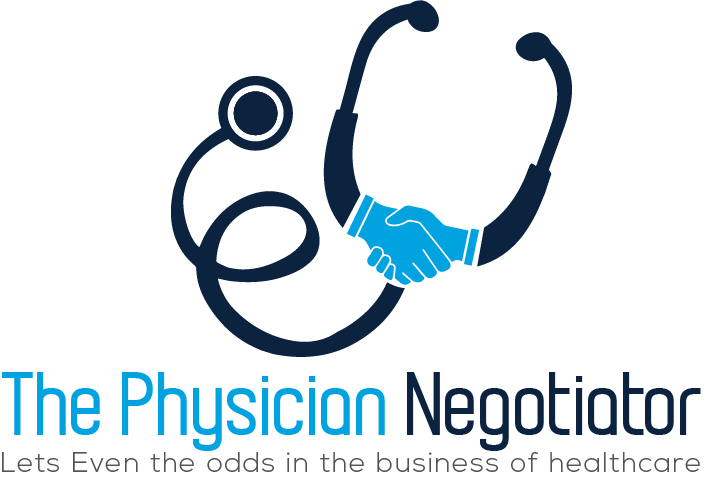 get every episode of the physician negotiator in you inbox! Thanks for subscribing to our weekly show! Check us out at iTunes, Stitcher and Spotify too!